His trilogy EP has the concept “I wish my respect artsist do remix my track”. The last episode of the trilogy is “Sense Of Values” that includes Remix by Tomoyuki Sakakida. Tomoyuki Sakakida calculated a sequence minutely, and he set Oriental Melody as his feature. His speedy remix will excite listeners!! These trilogy EP series is big bombs for DJ’s, Dance Floors!! Sakakida Remix is good one, but not what i play at the moment. Original Mix is the one that I’ll most likely support in my sets. will b in FULL SUPPORT!!! Both tracks are really great!! Thank you for amazing music! Loving the tough edged techno inspired sound. Nice groove in the original. Original Mix is cool. Will play for my next radioshow. Nice Groove! Original Mix for me. full support! Tomoyuki Sakakida Remix for me! Perfect Blue ranked No.37 at Beatport Progressive House Top 100 Releases!! 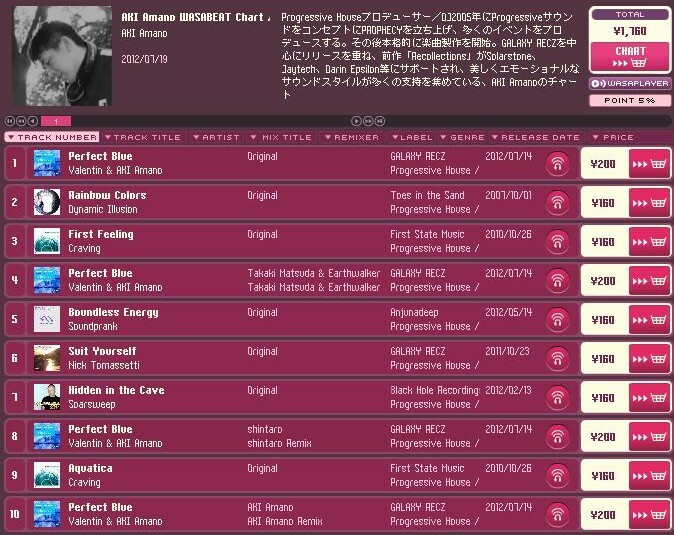 「Perfect Blue」 ranked No.37 at Beatport Progressive House Top 100 Releases! !